It is imperative to have sturdy, predator proof housing for waterfowl in place prior to even considering getting or adopting these fine web-footed friends. All waterfowl need protection from predators. Housing should be predator proofed on all SIX SIDES including the bottom of the house. Most predators will dig to get at nice plump ducks or geese for food. Hardware cloth with 1″ or smaller openings are mandatory to keep other beasties OUT! Housing must be constructed in a sturdy fashion. Many predators are large in size and can bend simple wire cages easily. A sturdy wooden or metal frame is best. Housing must provide good protection from the outside weather. Yes these guys have lots of feather and down to keep them warm and dry, but they do need protection from severe heat, cold, and precip as well. The shelter need not be new or fancy just practical. Ducks don’t really care if the style is a New England Salt Box or a homemade crate fashioned from recycled wooden pallets – they just need protection from the weather and predators. The floor needs to have a floor that is easy on their webbed feet, is easy to care for and still provides protection from predators. Buried galvanized hardware cloth is a good solution. 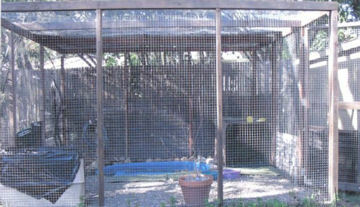 This duck enclosure is approximately 12’ x 12’ and is a good size for up to 4 ducks. The wire used is a 1” x 1” welded wire which is quite sturdy and makes the enclosure predator proof. 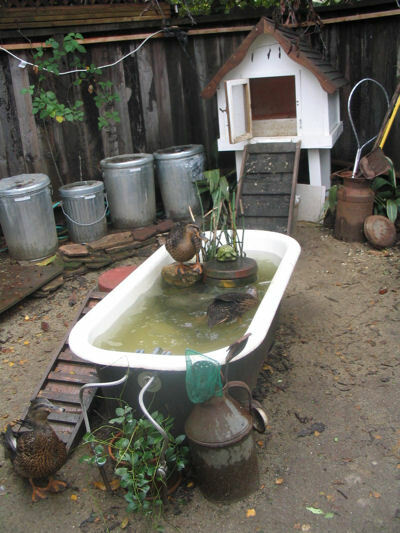 The pond is a kiddie pool sunk into the ground for easy access. A pump is used to siphon out the water and a hose to put in clean water. 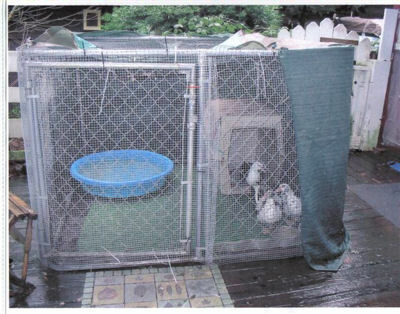 There is a large wire dog crate in the corner which is wrapped on 3 sides and top with a tarp for water proofing, the ducks can use this for warmth and protection from the weather. There are mats on the inside for easy clean up. Green rubber mats are used for the ducks to sit on as a soft surface and are easily hosed off by hanging from the side of the enclosure with pants hangers. Note the secure wooden house for keeping them safe from predators at night. No duck or goose should be left unprotected especially at night and during the dawn and dusk hours when predators are especially active. 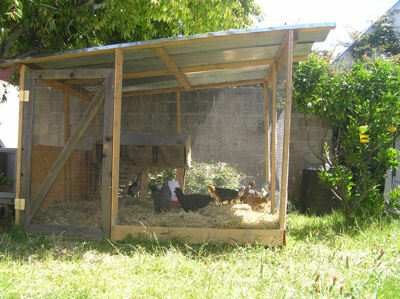 This final enclosure uses commercial steel chain-link fencing and a dog crate to provide a safe environment for those duck lovers who don’t have time to build custom enclosures. Note that the standard openings on chain-link fence will allow predators to reach in and kill your pets. Wrap the enclosure in 1/2″ hardware cloth, waterfowl will slip their necks through the openings to get at that extra-tasty green grass on the other side, leaving a perfect chance for a predator to turn your precious pet into their dinner. Please remember – make sure the ducks and geese have shelter from wind, rain and snow (and sun in the summer!! ).